Cindy, a Senior Private Banker with TD Wealth, has over 20+ years experience as a professional advisor. Cindy will work with you to create and implement a personalized and comprehensive Wealth Strategy. Her primary goal is helping her clients to understandi their long term financial vision. A robust Wealth Strategy can address your day to day banking and credit needs, as well as your investment ojectives, estate planning considerationsand other important wealth considerations for you and your family. 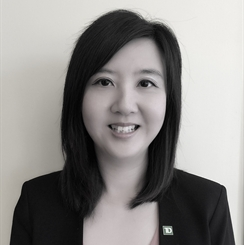 Cindy will assist you, drawing upon the expertise of the appropriate TD Wealth Private Client Group specialists. Cindy holds a Personal Financial Planner (PFP) designation. She is activetly involved in the community and participates in the TRIEC Mentorship Program and is a Director of the Taiwanese Association.